We know that you want top quality, genuine brand names at a price that won’t break your budget. We know that you need the convenience of online shopping 24 hours a day, 7 days a week and we know that you don’t want to wait long for your purchases. We know that you want great customer service and no questions asked after sales service. We have over 10 years experience in retail business. We work closely with our international suppliers to ensure you get the best deal. We offer next day despatch of all orders so you receive your goods quickly. We offer no questions asked money back guarantee if you’re not happy with your purchase. We have delivered thousands of parcels to happy customers across the globe. It’s lovely and cool but heavy and cozy. Cool in summer hopefull warm in winter?light and comftable. Believe the hype! These silk quilts really are as good as they say! Very happy with price and quick delivery. The quilt is lovely, a joy to sleep under. The silk quilt is light, breathable and warm without being too hot. 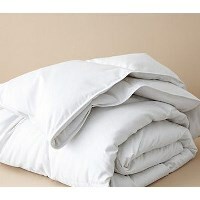 A great alternative to feather and down quilts especially for allergy sufferers. I was not 100% convinced for this purchase, I was told by friends that I will be surprised. They were right, I changed my wool quilt to this silk quilt for good. It is light, it is warm, it is comfortable. I am happy with my purchase. I bought the Polish Goose Down Doona in April 2016. I am using it for winter. I could'nt be more snug and warm. Beautiful winter doona.